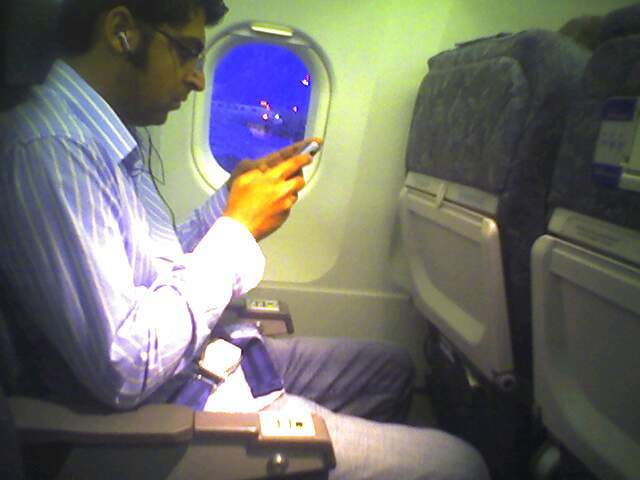 So I was on a plane some time ago, a flight from Ottawa to Toronto. In typical dweebish fashion, I had my headphones on and was tip-tapping away on my PDA. I paused and considered myself. “What a doofus I must look like,” I said to myself. “A silly brown dude with headphones and a PDA. Gakkkk.” Then I looked to my left, and there was another silly brown dude with headphones and a PDA. Yes, this is his picture. Seems we’re taking over the world. Or at least Air Canada. Congratulations to an old friend in DC, Ms. Dawn Logan, for her recent marriage. Further congratulations to resident Deonandia villain Darth Vadum, for his impending 40th birthday tomorrow night in DC. Sorry I can’t be there to have a cigar with you, bud. Sad news from Montreal yesterday as yet another gunman shot and killed innocent student types. As this CBC photo shows, the bugger was a brown dude. And a Goth. As I wrote in this article about the Columbine shootings, there is a tendency for society to marginalise the wrong group in the aftermath of such tragedies. I expect the regular vocal set to be criticising Goth culture again, without basis. After all, Goths are just a bunch of fashion-challenged kids doing what all kids do: act weird and depressed and selfish. Nothing abnormal or dangerous about them. What’s truly weird about this story, though, is that the dude was a brown Goth! Come on! Brown dudes don’t get pale enough! Of course, speaking of targetting the wrong marginalised groups, I’m just counting the seconds until some wingnut blames this event on “Islamofascist” terrorism. Courtesy of SM (apt initials), and in lieu of the Daily Perv Link, I give you The Sinulator. And courtesy of RVE, I leave you with this excellent collection of sidewalk art.